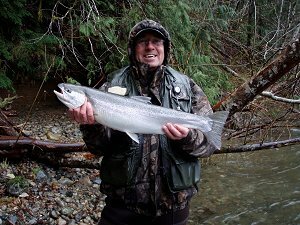 22nd October, 2010: FISHING REPORT: Port Alberni Inlet, Barkley Sound, Ucluelet (West Coast), Somas-Stamp River System. The Summer of 2010 is over and we can only look forward to 2011 which many are saying will again be a great year for fishing on the West Coast of Vancouver Island and also the Port Alberni Area. The great summer fishing for 2010 actually began in the mid-spring with feeder Chinook in many of the popular areas close to the Ucluelet Harbor and into Barkley Sound. The migratory flow of salmon swimming to watersheds to the south was very strong but many of these fish which peaked at times in terms of the various runs were mainly in the three year old category through June and July. However in August some big Chinook arrived and during this time there were many salmon landed by sport fisher persons in the 35 to 45 pound range. Most of these big fish stayed offshore a few miles where there were great quantities of Pilchards and Sardines. Unfortunately Barkley Sound did not have a lot of these fish come in and feed only because of the great quantities of bait fish in the offshore waters. The Ucluelet waters also benefitted the large return of Sockeye to the Fraser River which was well over twenty million. Sport fishermen and guests on guided trips were thrilled with some beautiful ten plus pound Sockeye hitting their lines. The Alberni Inlet had some fantastic Sockeye Sport fishing. The season started around June 10th and many sport fisher persons and guides were still doing well on Sockeye in the middle of August. The forecast run size for Somass Sockeye for 2010 was 600,000 and it is thought that the final count will be somewhere between 1.2 and 1.4 million. Chinook and Coho returns to date through the counters at Stamp Falls are showing approximately 23 to 24,000 Chinook and almost the same numbers for Coho. By this time last year the Coho return was much higher. The 2010 salmon season was banner for sport fishing and there definitely was higher than normal returns of salmon swimming into local rivers and streams and the migratory flow was very high for those fish swimming the coastline of British Columbia to destinations to the South. What will the fishing season for 2011 be like? The early pre season predictions look very good for Aberni Sockeye and offshore Chinook and Coho. Of course these predictions are pre-mature. No one however will be surprised if the fishing is better than this year. The Chinook numbers should be good and the fish bigger in 2011 with four year old returns to various home streams being very predominant. The Chinook return to the Terminal area of the Port Alberni Inlet and then to Robertson Creek Fish Hatchery was forecast to be 43,000. To date approximately 23,000 Chinook have passed through the fish counters at Stamp Falls. It has been mentioned by DFO over the years that the needed number of Chinook for potential egg counts of 57 million is 34,000. 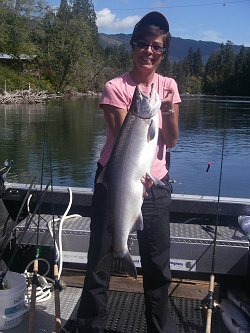 In September the lower Stamp had some great Chinook and Coho fishing. 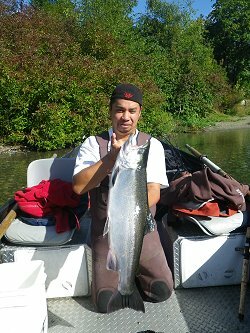 The great salmon fishing has continued into October with the best fishing moving up into the Upper River. There have been some Chum returns in the lower but these fish have not been heavily targeted. Currently most guides and guests are fishing for Summer and Fall Steelhead. The river flow in very high for this time of year and the temperature is at 12 to 13 degrees. Because of the high water most of the fishing has been on the float. Often this is the time of year when some of the best fly fishing occurs. September had some big rains and this has affected water heights. On the float aboard drift and jet boats individuals are using bobbers and fake eggs with a weight and bouncing the bottom. Spin-n-gloes and corkies are also working well. The salmon are in their natural spawn and the Steelhead are very active and going after everything they see. 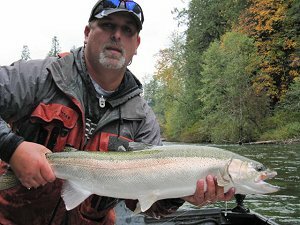 The Coho that are arriving in the upper river and that are being targeted by sport fishermen seem to best attracted by spinners. The Stamp River fishing for Fall Steelhead will continue well into November. If river levels come down to more normal levels and water temperatures do not dip then the fly-fishing should pick up. Dark fly patterns at this time of year are often the best. The September weather was not as predictable as it normally is. The weather pattern in September is often calm water, little fog, and sunny afternoons. After a very dry summer, the early fall weather conditions were wetter than usual with higher winds than what is normal. This poor weather pattern did hinder some great fishing days. However those days that were fishable through September and the first half of October were fairly good for mature Chinook, feeder Chinook, Coho, Ling Cod and Halibut. The Rats Nose out at the Big Bank developed some good Coho and halibut fishing. The early fishing saw good numbers of wild Coho but as time moved along the wild and hatchery that were landed were similar in numbers. The inside and outside South Bank has been very good and has continued that way right up until this past weekend. There have been good numbers of feeder Chinook and some good sized hatchery Coho. The halibut at the inner and outer South and the corner have been fairly reasonable. 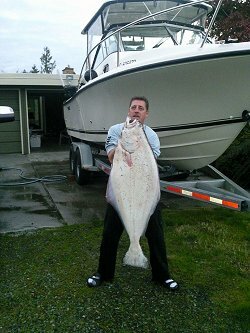 The largest guided trip halibut landed this fall was weighed in at 81 pounds and was picked up on the troll like many of the other halibut catches, using an army truck hootchie. Guide Wayne helped guests from Vancouver land this halibut plus several feeder Chinook and Coho which were all very deep from 130 feet to the bottom at 154 feet. The Feeder Chinook have averaged 10 to 13 pounds and there have continued to be a few mature Chinook in the high teens. Some beautiful silver Coho are also around but are few in number with those that have been landed and able to be retained averaging 15 pounds. The salmon are hitting needle fish hootchies and a T-Rex Hootchie. Outside the Ucluelet Harbor there has been some unbelievable Ling Cod fishing. The Lings have been at Janny Reef and in unbelievable numbers. Jigging with a cod jig and also herring has created some sensational catches. Most of our 8 hour trips include not only salmon fishing for mostly feeder Chinook and then Ling Cod in close to the Harbor mouth. The Alberni Inlet fishing has been poor since early September. The next opportunity will likely be the opening of the 2011 Sockeye season. Look for DFO regulations regarding any prawn fishing for openings and closures in the upper and lower inlet. Barkley Sound has been very spotty. Sarita Bay had some Chum salmon fishing. The Kirby Point area, Sanford and the backside of Fleming Island has had some Coho but most of this has dried up. At the moment little fishing is occurring in the Sound but some fisher people will begin to fish areas around Effingham Island, Swale Rock, and Vernon Bay for Feeder Chinook. The key to Feeder Chinook fishing is bait. Find the bait fish and one will find the Chinook.